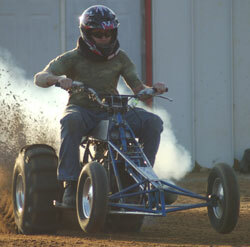 Atoka Motorsports Park in Atoka, OK opened and started holding sand drag racing events in the fall of 1992. They started with humble beginnings of just a few races per season. This changed in 1994 with the schedule expanding to one race per month, from March to November. A point series was added in 1997 to give the racers something to shoot for throughout the season. 1999 saw the first Heartland Nationals take place with help from the ASDA. The tradition continues on with AMP hosting the Heartland Nationals for the 19th consecutive season in 2017. Racing continues on in 2017 with events being held the second Saturday of every month, March through November. Special events include the Heartland Nationals and the Fall Fest (previously known as the Watermelon Nationals).